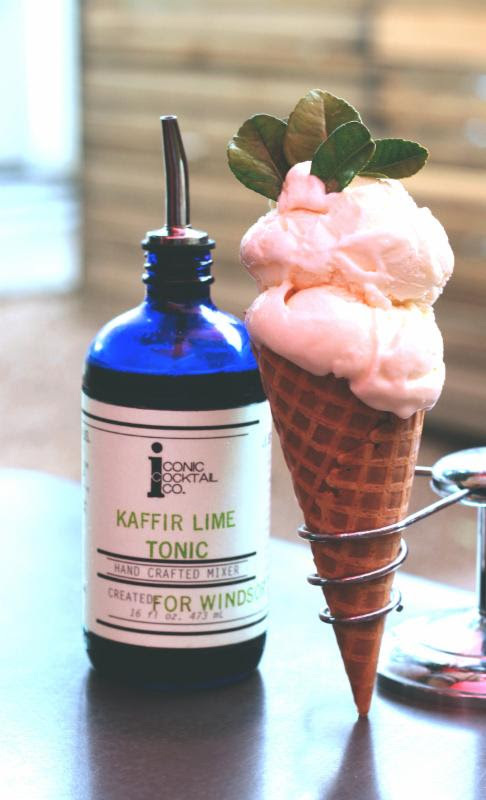 Everyone’s favorite locally-owned ice cream parlor, Churn is celebrating National Ice Cream Day with $1 mini scoops of gourmet Kaffir Lime Ice Cream. Handcrafted in collaboration with Phoenix’s own syrup gurus at the Iconic Cocktail Co., swing by on Sunday, July 17, 2016 from 2 – 5 pm, and enjoy this special one-day-only (non-alcoholic) flavor. Sweet, tangy and addictively cooling, this classic summer treat actually comes from the leaves of locally-grown citrus, that have been distilled into a herbal tonic and then mixed with premium dairy products and chilled to create an irresistible frozen treat. Even tastier, everyone who visits Churn for a $1 mini scoop on National Ice Cream Day will be supporting the local entrepreneurs behind Iconic Cocktail Co. Founded by Kaylee Nedley and Matt Farrow, the Beverage Manager at Windsor (located next door to Churn), Iconic is renowned for its small batch cocktail mixers and refreshing herbal tonics made with fresh, locally-sourced ingredients and hand-stamped with the date it was bottled. Iconic’s mixers can also be found shaken into several of Windsor’s craft cocktails. In addition to one-day-only $1 mini scoops of Kaffir Lime Ice Cream on National Ice Cream Day, stop by for one of Churn’s other handspun ice cream flavors, frosty shakes, custom-built ice cream sandwiches or a decadent sundae. You can also treat yourself to Churn’s selection of nostalgic candy for the ultimate sweet escape.